Senior Fire Investigator Kent Grier being interviewed by KWCH-TV regarding the possible fire danger posed by flexible gas tubing. We seek the cause of fires and explosions. Our investigators have decades of experience conducting fire and explosion investigations. Each investigation conducted by KGFI, Inc., also includes at least one investigator who also has a background in the field of criminal investigation. We provide the most complete information possible with regard to the origin and cause of any fire or explosion, so that strategic decisions can be made based on our findings. We have a very enviable record of success with both our findings in the field and in providing court testimony in matters of both subrogation and criminal defense. “CFI”certification is granted by the International Association of Arson Investigators. 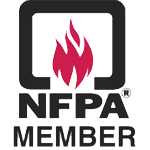 “CFEI” certification is granted by the National Association of Fire Investigators.